Your battles will be swift and victorious whenever you wield this Gladiator Small Shield and Sword in combat. Made of plastic, the 2-piece weapon accessory includes a gladiator shield and sword. The circular shield features a lion head emblem molded on the front with a leaf detail around the edges. The sword features an ornate gold handle with a gray blade. 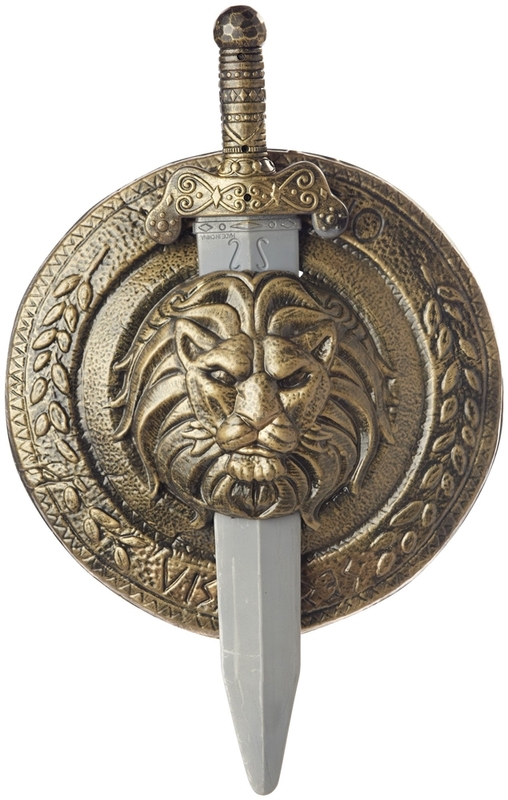 The sword fits through the center of the shield allowing for easy accessibility. Battle on this Halloween with this Gladiator shield and sword set. Size is perfect for kids. 19 in. x 13 in. x 2 in.